I have been thinking about what to do ‘next’ for a while. I have been knocking off marathon-states for a few years, and will be at 44 by the end of the year (fingers crossed) so I have decided to dabble into ultrarunning. I never really liked doing speedwork, which is now defined as anything under 10K, I just like going out and running and a nice gentle but solid pace (read: 7:30/mile) which is usually my recovery pace. A few months before my first marathon back in 2006, I ran a half marathon just to see if I was going to die. I didn’t and it boosted my confidence quite a bit. A few months ago I signed up for my first 100 mile race, the Burning River 100 in July. Before I attempted that race though, I wanted to make sure I could run 100 miles and not die. A 24 hour race (where you have 24 hours to run as far as you can) was a perfect idea for a ‘test’ run. I got to VA in time to take Friday ‘off’ just relaxing all day, in preparation of a long day running. I only ventured out to go grocery shopping for the race and to visit the USS Wisconsin, who sits permanently in Norfolk, VA. 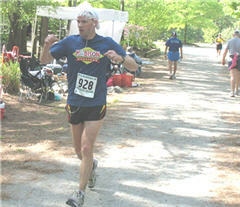 This race involved a 3.75 mile loop at the Sandy Bottom Nature Preserve, a beautiful area in Hampton, VA. The trail itself was ground rock and I was very surprised that not once did a stray rock get into my shoe. Granted, one long section was near the interstate, and once small section near a stinky swamp, but every part of the course was beautiful. I have a horrible habit of starting out races too fast (even marathons) and I knew I couldn’t do that this time. I had raced the previous weekend and my legs had not quite recovered completely, so I decided that when the race started I would walk the first 0.5 mile of the race. My goal for the race was to always be moving, never sitting down for more than a minute to tend to my feet. The first half mile of every loop was walked, all 27 laps. The other thing I did was consume some food every loop. A can of soda (no gastric distress! Yeah! ), a handful of gummi bears, a bag of chips, a small snickers bar, whatever. Always keep moving. Time spend sitting is time wasted. Each loop I took a container of fluid and some food. This strategy seemed to work quite well as I never hit the wall, it was my swollen ankle that eventually stopped me. 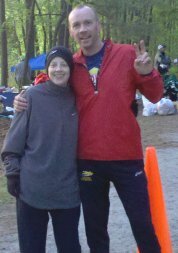 As I was getting near the end of lap 1, I came up on a professional ultra runner,Sabrina who ran a 17:21 at Umstead 100 miler 2 weeks ago. Sabrina was the model of even pace. We chatted until the end of lap 1. I took my walk break, and she moved on. I caught her with 1-1.5 miles to go each lap for the next 5. Pleasant conversation made the race go by nicely. She ended up dropping at just under 60 miles, complaining of not being fully recovered from Umstead. My first marathon (7 laps) was done in just over 4 hours. Each lap was taking me about 35-40 minutes. The weather forecast was supposed to be clear, but it rained on and off for those first few hours, which really stunk. I never got really wet, just annoyed. By noon, the sun came out (mid 70’s) and was a little hot. My feet did great the whole race, I changed my socks and shoes at 40 and 80 miles. At about mile 20, I got a small blister on the side of my big toe (never had one there before) so I stopped, cleaned it, added some moleskin. My athletic tape wrapping and petroleum jelly cream worked like a charm. Losing 5 toenails from last weeks marathon probably helped me. Second marathon done in 8:35, laps down to 45 min each. By then I was walking twice per lap, once at the beginning, and once about halfway in. Remember, that was always my plan. Never stopping, always moving. My legs were starting to fail, but I could still move. Afternoon slipped into early evening, and I started to get tired. Still no stopping for more than a few moments and my third marathon was done in 13:44. The sun was now essentially down and I started walking pretty much the whole time. What is interesting is that I was still moving pretty fast. The last lap that I ‘ran’ any portion took me about 47 min. My first ‘walking only’ lap took me about 52 minutes. I managed to keep that pace until the very end. My goal for the race had always been 100 miles, which is just under 27 laps. With 2 laps to go, I actually took my first sit down break. I sat down and took my shoes off, but just for 5 minutes, then back on and back out. 100 miles in less than 20 hours, after that it’s all gravy. So I could stop and note it, I took my GPS watch for that 27th lap so I could stop dead on the spot that was 100 miles. At ~2:45 am Sunday, I reached that spot. I sat down, turned off my headlamp and contemplated my accomplishment for a moment (and to update my facebook status) before I got up and walked (slowly) back to the start/turn around point. I got back at 3:15 am, and had 4 hours to go. Having accomplished my 100 mile goal, I decided to take a long break. I actually headed to my car and turned on the engine, as I was now cold and not feeling well. My plan was to sleep until 5ish and then head back out to do one more lap to finish at 4 full marathons. When I woke up, my ankle was screaming at me, and it took little time to convince myself that I was done for the day, so I slept until 6:30. I had dropped out in 2nd place, and ended tied for 4th place. Once I woke back up, I felt better so I slowly tore down my little aid station (large box of food, my gatorade, lawn chair), grabbed my 100 mile plaque and got on the road. I had hoped to get a shower in before I left, but there were none at the park so I just took off onto the interstate, with tape still on my toes. I had 11 hours of driving in front of me, and thought there was a chance I could get home Sunday night. I had slept about 2.5 hours there at the end of the race and I made it about an hour down the road before I had to stop. I curled up in the back of my SUV and slept for a little over an hour. Made it another 2 hours along my way and then slept another hour. I hoped I could make it home before the sun set, as I have a hard time driving at night especially after what I had gone through the previous 36 hours. I made it home with about 15 minutes of daylight left. After tending to my feet I finally took a long deserved shower and then crashed. I feel like a rookie, now having done my first 100+ mile race. I almost think it was too darn easy. I am sure I will run another one and I am sure I will get hammered in some future race, but this one seemed an easier effort that I ever thought it would be. Here, a day later my body is hurting but not much worse than after my worst marathon. Marathon. 26.2 miles. Who ever thought I would see that is a short run. So lately, as I work along my struggle to complete marathons in all 50 states before I turn 40 (I will be at 44 states by the end of 2010, me age 38.5), I have been trying to find new motivation. My state chase is fun and exciting, but I needed something to mix it up. I have thinking about running longer races and signed up for a 24 hour race in April several months ago. Back in the winter of 2008-09 the weather was really cold so I started running in the JCC fieldhouse because I am a wimp and don’t like running in the cold (One bad experience, and it ruined cold weather running for me, go ahead, you can probably figure it out. I ‘ll give you a hint: I’m a guy) but the fieldhouse is not that big and the ‘track’ is <200 m long. As such, you get bored really quick. I decided one day to pick up a basketball and dribble, just to break up the monotony of the running. It worked as I made it through the off season still in great shape and went on to have a fast and successful 2009 marathon season. So winter comes in late 2009 and it gets cold and again I am back into the fieldhouse, again occasionally dribbling a basketball, sometime for as long as an hour and a half. 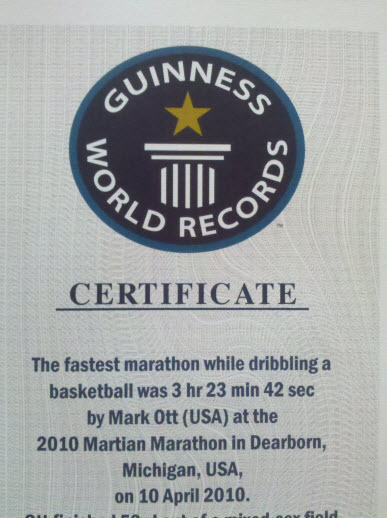 Sometime in Jan of this year I was dribbling along and got to wondering if there was a world record for fastest marathon while dribbling a basketball and what the record was. After my run and a few minutes researching, I come to find out the current record was 3:48, set by some guy in the 2009 LA marathon. The way I actually found out was finding the blog of a guy in CA who was raising money for underprivileged kids for scholarships and was training to break the record in March at the Napa Valley marathon, which, by that time, I had already signed up to run. I thought about making the attempt the same time he did, but decided against it, thinking it would be nice to let him have it (albeit briefly). 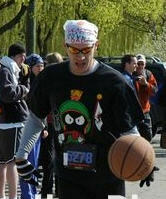 I was looking at the calendar and saw the Martian Marathon in mid-April and thought it would be perfect for my attempt because it was near home, (only an hour away) well organized, (I ran the half marathon back in 2006) and very flat. I signed up and eventually got ‘permission’ from the race directors to make the attempt. I submitted the initial paperwork to Guinness and they sent me the official rules, how to certify the record (if broken) etc. I was all ready to go. The record attemptor at Napa Valley (I never saw him, only the spare basketballs along the course) failed, running a 4:20ish because of a bad fall at mile 14, messing up his knee. I felt bad for him, but good because I still needed to only beat a 3:48, slower than any marathon I have ever ran. Being exactly one week before my first ever serious ultra marathon, the Martian marathon was at the end of my taper which was good. I was in shape, ready to go complete, with a brand new basketball. My Mother was in town for an Episcopal church meeting so I actually crashed at her hotel the night before (Thanks again Mom!) which was right next to the race start/finish. I woke up and followed all the standard race day procedures and made it to the race about 20 min before the start. A little chilly, but actually perfect race conditions. As has happened to me many times, moments before the gun I see Chuck Engle at the start. We chat, wish each other luck (he would actually win the whole race) and then we were off. A good, fast field of runners, and I started my dribbling. The only crowded place being that first 400m or so. People gave me a wide berth and at no point during the race did anyone bump into me. The first mile went by in 6:20 and I knew I was wrong, going way too fast so I slowed down and tried to get into a rhythm that I could maintain. People along the course cheered me on, some knowing was I was doing, many thinking they were funny making (lame) jokes. “Double Dribble!” “Where’s the hoop? “, “Between the legs, man!” I did not laugh at any such cracks. Had to focus. I lost control only 3 times. Each time stopping, going back to where I lost the dribble and began again. Also, I came to a full and complete stop at ever water station to drink. My dearest Mistique was my support crew, finding me at several spots along the course with my spare basketball and a video camera to help document the record. As the miles went along I started getting really tired. Turns out my arms would not get that sore, but it just took a lot more energy than I expected. Your running stride becomes inefficient when you are dribbling a basketball, most notably my stride length getting shortened. I would end up losing 5 toenails after this race because of my toes slamming into the front of my shoe with every (short) stride. I ran a 3:23 but I had to probably do 10% more steps than a normal marathon. I took exactly one walk break for about 400m right around mile 24.5, I just had to and knew I wanted to finish by running. I knew I had the record sewn up, so I had to rest just a bit before the final mile. 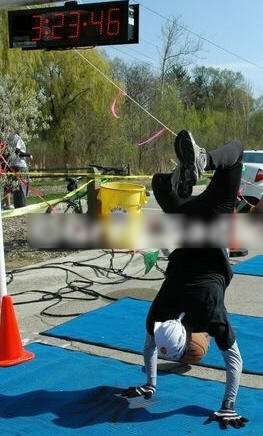 I came across the finish line, stopped, set the basketball down, and actually did a handstand. I have no idea how I did, but the small miracle happened.